Remember as a kid when you would whisper in the person’s ear next to you, then they would whisper in the ear of the person sitting next to them, and so on? By the time it would wrap around the room and get back to you your story would be anything but what you started with. Insurance has a tendency to be like that. Below are 12 insurance myths debunked for you. The color of your car doesn’t affect your insurance premium. That’s not necessarily the case. Is your driving history clean (i.e. tickets or accidents)? Did you recently upgrade your car? Every insurance company will have slightly different guidelines. So don’t bank on a huge savings on your 25th birthday. Comprehensive auto coverage doesn’t cover your auto for everything. Injuries or fatalities to anyone in your auto or another auto. Collisions with other autos (or buildings or trees). Medical expenses for you or your passengers. False, insurance follows the auto, not the driver. I let you borrow my car to pick up some groceries and you cause an accident, it will be my auto insurance that pays for the other parties’ injuries and damages to their auto. That statement (or anything close to that) is so far from the truth. It doesn’t matter if you’re a male or female stay-at-home parent, you take care of the tangible and intangible tasks of running a home. If you suddenly weren’t in the picture, who will do those duties? Could you afford to pay someone to help with the day-to-day tasks? It’s Friday afternoon. Jeff runs into the bank to cash his paycheck. On his way out he notices his car window is broken. Glass everywhere. Jeff’s iPad, text books, fishing gear, and Air Jordans are stolen from his car in the parking lot. Jeff’s car insurance will cover him, right? Wrong…Personal property items such as these fall under his Renters or Homeowners Insurance. A Personal Auto Policy is distinctly different from a Commercial Auto Policy. If you’re using your truck to push snow in the winter or delivering pizza with your car and haven’t talked with your independent insurance agent, you may not be covered. It’s not uncommon for a Personal Auto Policy claim to be denied because the auto was used for business purposes. Last week’s wind blew so hard, the storm door slipped out of my hand and broke the hinges. No worries, I have home insurance. Coldest day of the year and my furnace repairman tells me I’m going to have to replace my furnace…Homeowner insurance better cover this. No, negative, not for all the tea in China…these are not things you should turn in to your homeowners insurance. Maintenance items (like the ones above) are not insurance claims. Insurance is not designed to be a maintenance plan. If you own a home long enough, maintenance will be needed at some point in time. If you don’t mind tackling projects around the house, Youtube is a great resource for some things. You can’t beat a trustworthy contractor. Ask your friends and family for recommendations. You might consider a Home Warranty. 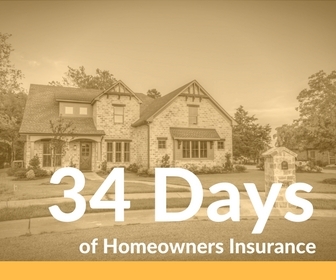 Home Warranties are intended to take care of maintenance items around the house. As an insurance agency, we don’t offer these. Google Home Warranty OR ask your local Realtor if they have a recommendation and details about home warranties. Unfortunately, the answer is no. Flooding is not covered on a homeowners policy. Flood insurance is a separate policy. If you’re pulling a trailer with your truck or SUV, liability coverage is extended from the auto pulling the trailer. If the trailer comes unhooked and damages a car, liability coverage from the vehicle pulling the trailer would extend. Physical damage to your trailer is not automatically covered. You must add Comprehensive (also known as Comp) to your trailer if you’re worried about fire, theft, vandalism, or a large animal running into the side of it. Otherwise physical damage is not automatically covered. Let’s say your driving history was spotless (no accidents or tickets) when you started with your insurance company. It’s a safe bet you were receiving a loss-free discount. Then last week you hit a deer. When your auto policy comes up for renewal next, it’s likely your loss-free discount will be removed. Frequency of comp claims and not-at-fault accidents can also impact your premium. If you have multiple comp claims in a short period of time (1-3 years) there is a good chance it will increase your premium. According to the National Insurance Crime Bureau, in 2015 the number 1 stolen car in the US was 1990’s Honda Accords. 52,244 to be exact. Honda Civic comes in second and Ford pickups come in third. A majority of the time stolen autos are sent to chop shops and pieced out. Typically older vehicles are simpler for thieves. We’re still not certain if bigfoot is real, but we know these 12 insurance topics are often questioned. If you enjoyed this post, I would be grateful if you would help it spread by emailing it to a friend, or sharing it on Facebook or Twitter.